This level has hard difficulty. 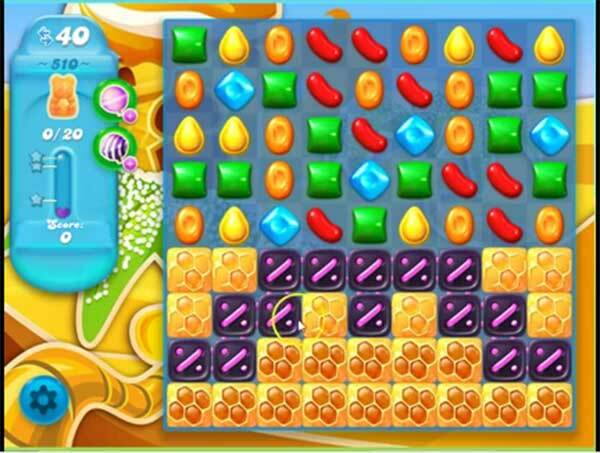 For this level try to play from bottom near to blockers and honey to eat them and as you play from bottom candies will shuffle everywhere and will give chance to make special candy. Combine special candies with each other to break more honey to save the bears within 40 moves. This isnt level 510 candy crush soda!!! You have to eat the honey & collect 20 bears in 40 moves. What’s going on here please? Stuck on level 510 since Feb.20 I need help BUT no one helps me I thought candy crush mom would help me like you have helped me before .Do you still have this LINK please let me know and answer my comments. Nope. Still old video. Waah ?? Need help on level 510 can only save 13 bears takes too many moves to clear blockers candy crush mom can you help me Please Thank You. I’m stuck too. I saved up to 16 bears and runs out of moves. you would need to have mad color bombs and strip candies to get out of this one. Still stuck on level 510 candy crush soda can only save 14 bears impossible to clear all blockers with only 40 moves need help really bad PLEASE SHOW ME THE TRICK ON THIS ONE. Can only save 14 bears too many BLOCKERS to clear Benn on this level since February about ready to give impossible to clear with only 40 moves can I get help PLEASE. DO YOU STILL HAVE THIS LINK CANDY CRUSH SODA MOM I NEVER GET A REPLY FROM YOU? I see everyone writing that you helped before I have never gotten helped ,when o am stuck I had to pay to move on spent $$$$ of dollars and I could never even get the jackpot spin ! Smh ! I’m a complete novice and have gotten this far by perseverence and luck. As I have commented before, I don’t spend money and I have over 50 of all bonus things–I don’t even know what they’re called. The spinning thing that’s supposed to be the best one of all seems completely useless to me and the rest aren’t much good either. The game forces you to use them in useless places and blocks you at every turn. I’m not good at figuring out how to make things drop where you want them and I don’t have any idea what “lives” are or how you get them or how you even know you have them. When I pick a fish to use at the beginning of the game, it swims across the board and I don’t even see a change. I pick bonuses (if that’s what they’re called)once in awhile because I think the program gives you a little break sometimes if it sees you’re using them. I know it does no good to hoard them but I’ve rarely benefitted from any of them so what’s the point? And yet, here I am at 510 somehow. My main point of this rant is I read a good tip on another site and I’m going to try it. I think it could work for good players of which I am not one. Instead of trying to store as many moves as possible for the second board, set up combinations to use later. I’ve noted where some leftover bonuses are placed, for use later and it hasn’t helped me but I’ve never tried deliberately setting them up. I have little faith that the game will cooperate but can’t hurt to try. Good luck everybody. I’ve heard some people say they’re on game 2,000. Sounds good but I’m old and I’ll be dead by then–possibly before I finish 510, even.